The 70th United Nations General Assembly began on Tuesday afternoon, bringing with it the annual chaos of street closures for which east-side Manhattan braces every year. 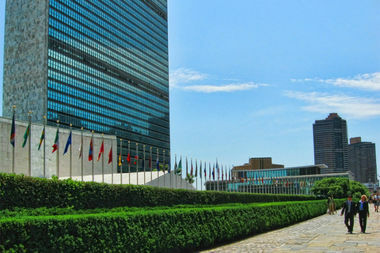 MURRAY HILL — The 71st United Nations General Assembly began on Tuesday afternoon, bringing with it the annual street closures that the east side of Manhattan braces itself for every year. The assembly this year is a far smaller to-do than last year's, during which Pope Francis’ visit to the city coincided with President Barack Obama’s visit and resulted in a traffic-cordoning operation of historic scale. But closures will still affect anyone driving on the east side between now and the event's end on Sept. 26. ► First Avenue between 42nd and 48th streets. The tunnel underpass from 41st Street to 48th Street will remain open for passenger cars. Trucks and other large vehicles will not be able to access until the end of each day’s session. ►First Avenue from 42nd Street to 48th Street. The tunnel underpass from 41st Street to 48th Street will remain open for passenger cars. Trucks and other large vehicles will not be able to access until the end of each day’s session.